Naomi Novik was born in New York in 1973 and raised on Long Island. Novik learned to read at an early age and her favorite books were by J.R.R. Tolkien and Jane Austen. She studied English Literature at Brown University and did graduate work in Computer Science at Columbia University. She became involved in the design and development of the computer game Neverwinter Nights: Shadows of Undrentide, but soon realized that she enjoyed writing books more than creating video games. Novik’s first novel is His Majesty’s Dragon which is the beginning of the Temeraire series. She has won the John W. Campbell Award for Best New Writer, the Compton Crook Award for Best First Novel, and the Locus Award for Best First Novel. Several of the Temeraire novels have gone on to be New York Times bestsellers and the books are options by Peter Jackson to be turned into a movie or television series in the future. She is a member of the board for the Organization for Transformative Works (OTW), an organization dedicated to the promotion of fan fiction, fan videos, and real-person fiction. Novik is currently a resident of Manhatten and is married to entrepreneur and author Charles Ardai. They have one child. His Majesty’s Dragon begins in the year four (1804) during Britain’s struggles in the Napoleonic war with France. This is a tale of alternate history where dragons are alive and well and an accepted part of the landscape. They come in many sizes and breeds. Some spit fire or acid, others can turn on a dime in the air. When a dragon hatches, humans “put it in harness” in order to control the creature and use it for the war. Each dragon imprints on a human who becomes it companion and Captain. The HMS Reliant captures a 36-gun frigate during battle and the crew discovers that a dragon egg was being ferried within. Captain William Laurence declares the dragon egg a prize. The egg is about to hatch and Laurence gathers his officers together in the hope that the hatchling will imprint on one of them. The small black dragon with unusual six spines on his wings chooses Captain Laurence, much to his chagrin. Laurence names his new charge “Temeraire” after a second-rate French ship that was also captured and brought into service for England. The name means “reckless”. Laurence and Temeraire are inducted into Britain’s Aerial Corps. Laurence is used to the Royal Navy where the world is spit and polish formal and he is much respected as a ship’s Captain. He is in for a shock by the change of his status when he joins the Corps. The Captains who do battle with their dragons are an informal lot and the Corps itself is looked down upon as the least of all the branches of service. Still, despite the hardship to his character and career, Laurence develops an affection for the young dragon. 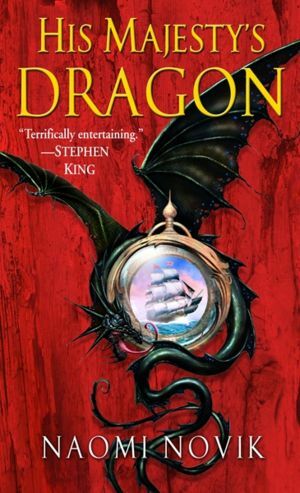 He learns that Temeraire is a Chinese Imperial dragon, one that is meant to bond with an emperor and is the second most rare type of dragon in the world. Only a Chinese Celestial, known for its powerful breath of “divine wind”, is more rare. Life in the Corps takes adjustment, but Laurence and Temeraire train together to become a battle unit. He and his dragon adopt a flight and ground crew that supports Temeraire in his care and during battle. Laurence also meets the mother of one of his crew, Jane Roland, with whom he develops a relationship. During the Battle of Trafalgar (1805), Napoleon’s navy and aerial strength is diminished. The moral of the Captains and their dragons is high during this victory for England, but during their celebrations, a Captain and his mortally wounded dragon arrive at Dover with important intelligence. Napoleon does not plan to send his troops by sea as expected, instead he will send them by air using transports hauled by dragons. This news ends the celebrations as the Captains prepare their dragons for combat, knowing that they will be outgunned and outnumbered. Laurence and Temeraire fly out with their formation to meet the French aerial armada, their mission is to destroy the transports. It is the final test of their team: The young dragon who is deemed unlikely to develop a breath weapon and the former seaman transformed into a flight captain. Can they meet the challenge ahead and save Britain from Napoleon’s armada? You’ll have to read the book to find out. I’ve been a fan of books about dragons starting with McCaffery’s creations on the planet of Pern. I am also a huge fan of Jane Austen and Tolkien, so when His Majesty’s Dragon came on the bookshelves in 2006, I purchased a book immediately. I was transported into a “flinklock” world of the battles between Britain and France due to Napoleon’s rise to power in the early 1800’s. There was one little change in the history of this book, dragons were real and a part of the art of war, much like elephants were used in battle in India and other South Asian countries throughout history, but these giant creatures have wings. Novik has a way of blending the fantasy elements into the details of her alternate history story that make these ideas seem natural and believable. The tale is mainly about the relationship between Captain Laurence and the dragon Temeraire and how they become comrades in arms and close friends, but the world building that surrounds these two characters is what makes the book shine. There is somewhat uneven pacing in places. I found the training section to be slower than the progressive battle scenes with the dragons and their onboard crews shooting with powder guns at the enemy. The romance between Laurence and Jane Roland was less than to be desired and perhaps could have even been cut out. His Majesty’s Dragon is the first of a series, the final book coming out in 2016. Novik is an excellent author and sure to please fans who would not mind a little fantasy and dragons mixed in with their historical regency era fiction.